Rated 5 out of 5 by Majestyx12 from Under the Sea I love the under water games. I wished they had a wallpaper with just the submersible with no character. I want to imagine myself there. In the ship looking at the sea creatures moving around. Elephant has the best morphs, fragments and collectibles but I want indicators and the ability to retrieve them. I don't know what I think about the Dark Trackers. I Love Elf but he needs some meat on his bones. The picture in the guide needs to be larger. I liked the story, hops and gameplay. I found a few puzzles I liked. They always have replays. Liked agent Shade made a appearance. Rated 5 out of 5 by Yurnmesis from Trial: Looks Like Everything I Want in a Game! Graphics: Excellent decor and themed design, can adjust color (Gamma) which I really enjoy Characters: Well developed and attired appropriately Voice Overs: Nicely done Hints: Transport Hidden Object Games: Nothing new but beautifully crafted Mini Games: When I read the words repeat, drag around, connect all lines, pass through all...I skip! Morph and puzzle pieces to collect Overall. This game has all the content and attributes that I look for in a game other than the Mini Games, but I'm not a fan of those. I find them a time waster and frequently more annoying than fun, but with the excellent graphics, design and development. I will purchase and recommend this one! Rated 5 out of 5 by ljmb21 from Great game! Exciting game, I enjoyed the graphics, story line and subject of the game. Rated 5 out of 5 by wildlifecrusader from Short but fun This is the shortest Collector edition I ever plaid, but I loved every minute of it. Got drawn into it from the beginning, the art work is stunning and the voice over very good . The professor has even a dialect, which I liked very much. Love to collect things and here are morphing objects, puzzle pieces and aquarium creatures. The puzzles are great, as well as the HOP's. In my opinion a delightful, entertaining game for beginners and advanced players. Try before you buy and you will see if you like it as much as I do . Rated 5 out of 5 by kieve101350 from Interesting game The concept art is excellent and some of the puzzles are difficult and/or time consuming. Took several hours for me to complete the game and I enjoyed it. The story line is okay. 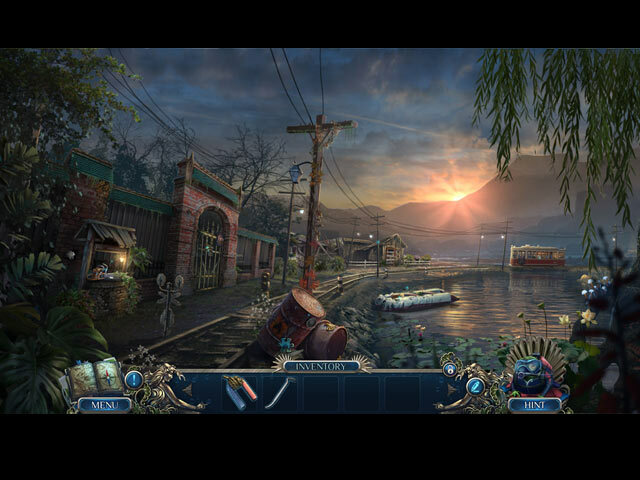 The hidden object puzzles are unique. Rated 5 out of 5 by Marja67 from Good Game. Good graphics, collect puzzle pieces, morphings and figures of animals. Elf is there too. Easy navigating through the story. Good past time. Enjoyed it. Rated 5 out of 5 by biscuitsmama from DID YOU JUST FIND THE ANCIENT ATLANTEAN CIVILIZATION? 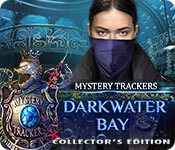 Mystery Trackers Darkwater Bay is the fifteenth game in the MT series. Once again you play a detective with the Mystery Trackers organization and this time you might have been given the case of a lifetime. Dr. Russell Jackman who is a renowned scientist has disappeared while working on his research vessel the Poseidon. No one has heard from him and it is feared that he might be in trouble. As you and your trusty companion Elf arrive on the Poseidon, it looks like there was some sort of disturbance and Dr. Jackman is nowhere to be found. By following the clues left by Dr. Jackman you are soon off on an adventure that will turn into a very dangerous mission. Travel to the depths of the ocean as you search for the missing scientist and confront members of the Dark Trackers organization in a rush to control a very ancient and dangerous artifact. The graphics are amazing and some of the best I’ve seen in recent games. If there is any drawback it is Dr. Jackman’s accent and voice acting that could have been a lot more natural and less contrived. Since it is not a constant part of the game I didn’t find it too annoying. Even though your companion Elf has traveled with you in this game, he seems to be very silent and not an integral part of the find and fetch crew. The HOP scenes are fairly standard and what we expect to find in games from this developer, but they have been stepped up and seem more interactive. Even though I really enjoyed the HOPS, as I didn’t have to search for really tiny and almost invisible items, what is excellent in Darkwater Bay is the variety and difficulty of the puzzles. There are some new puzzles that I really enjoyed and one of my favorite puzzles is found early in the game when we need to open a wall cache to find some needed items. Although it is not a difficult it took some time to solve. 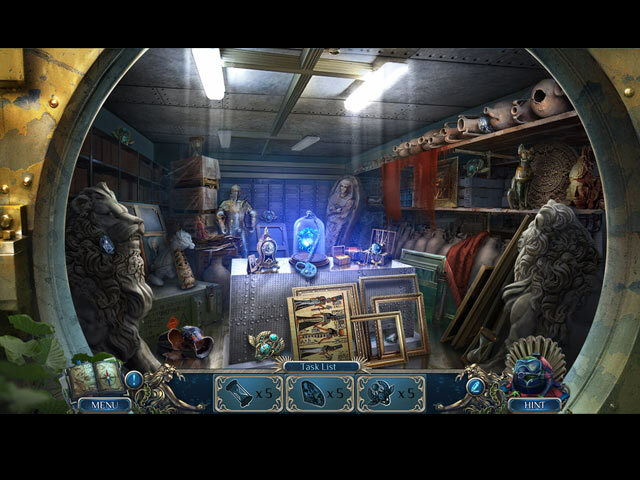 The CE version of the game includes morphing objects, collectible items and puzzle pieces to find. There are the usual achievements to earn and a smattering of other extras including the Secret Room that will open once you complete the game. As with all CE games there is the Strategy Guide and a Bonus Chapter. Since most gamers are no longer willing to pay full price for a game, the CE content seems to be shrinking along with the number of chapters in each game. Some gamers might find the game short since it only includes three chapters but it still has taken me quite a bit of time and I am still not finished playing. I love this game and find the gameplay has kept me quite busy. I am not a fast player who loves to rush through a game to see how fast I can complete it, but rather one who loves to look at every scene and enjoy the graphics and each little detail. This seems to be one of the best games in the MT series since those earlier ones in Raincliff. I played the beta for the game and have been anxiously awaiting the full game release and it doesn’t disappoint. Elephant Games nailed this one and has provided a great mystery game with a lot of action to keep me involved right through the end. Unfortunately I had to quit playing in the wee hours to get some sleep last night but I am right back at playing the rest of the game as soon as I post this review. As always please try the demo to see if this is a game you will enjoy. Happy gaming! Rated 5 out of 5 by rainworm from A Scientist, an artifact, a detective, the bad boys and Elf – an enjoyable package Russell Jackman is a known scientist, his specialty are artifacts in the sea. He successfully found the Tesseract, a powerful ancient artifact with not yet fully researched but dangerous powers. One day he is missing from the research vessel and we are on our new mission: finding him and investigating the case. Soon we find him below the ship, in an underwater area, where he has his office and more. But he is imprisoned. He can tell us, who his captors are: the opposite rival group of our mystery trackers, the dark trackers. But we are successful in freeing him from his cell and together we make it to a place, where we can board a small plane. Jackman will fly it but first, we have to do some repairs. Of course the dark trackers are close, so we need to hurry. Again successful, the artifact awakens and Jackman, who had it in his lap can no longer control the plane and the artifact’s power.... So the Mystery Trackers have found a rival group at last, the Dark Trackers. They are our opponent in this game. A fast paced game with many puzzles and HOS, all placed logically and enjoyable and of course Elf. The story is the usual one, but not at all boring. Mystery Trackers is one of the neverending evergreen series and we feast on every game. So nothing really new but a cosy thrill in 3 chapters, plus bonus chapter. Rated 5 out of 5 by sunnyglow from SUBMERGE YOURSELF IN AN INCREDIBLE UNDERSEA ADVENTURE REVIEW BASED UPON THE ENTIRE GAME: 3 Chapters Plus a Bonus Chapter – Strategy Guide: 42 Pages OVERVIEW: Detective! You are off to Atlantis! Submerge yourself in a breathtaking undersea adventure to battle the Dark Trackers. When a researcher of ancient artifacts, Russell Jackman, goes missing, you are sent to an underwater settlement to locate him. Upon investigation, you find out he discovered an ancient Atlantean relic with tremendous power, one which allows the user to control the sea. Now the Dark Trackers want this device for their own nefarious purposes. Enjoy some incredibly beautiful underwater scenery as you attempt to rescue Dr. Jackman and stop the Dark Trackers in their track! OPINION: I LOVED playing this game! What an incredibly beautiful game with oceanic graphics which are phenomenal! Kudos to Elephant for a well-designed game. This was an instant purchase for me as I have always had a fascination about Atlantis. This game should appeal to those who are interested in Atlantean mythology or those who love marine life. The game is somewhat short, but in this case, it is quality over quantity. To me, this is one of the best games from Elephant this year. This is an action-packed game full of creative HOP scenes and fantastic and unique puzzles. ELF – MIA: It would not be a Mystery Trackers game without Elf. However, his services are not used much in this game. He is only used as a helper five (5) times in the main game and only three (3) times in the bonus chapter. He completely disappears after the demo – the reason you will discover as you play this fabulous game. All of those who hate helpers in games, you might want to rethink not playing this one. Elf does not have much of a presence in this game. MECHANICS: There are the usual four (4) levels of play including a customized version. There are eighteen (18) achievements. Collect thirty-two (32) jigsaw pieces which provide a finished jigsaw puzzle at the end of the game. Collect twelve (12) denizens of the sea and twenty-seven (27) morphing objects. I found most easy to locate, although I found a few which were well-hidden. There are eight (8) wallpapers plus the usual casual art and music selections. You can replay twelve (12) mini-games and sixteen (16) HOP scenes hidden within the Secret Room. I feel this developer does themselves a disservice by not announcing the replay of the HOP scenes and puzzles in the opening part of the game. I, for one, evaluate whether to purchase a game based on whether I can replay the puzzles. BONUS CHAPTER: It is a sequel. Dr. Jackman is in trouble again! For a second time, he has been kidnapped by the Dark Trackers. This time, the Dark Trackers are seeking information on the location of the underwater civilization of Atlantis to rescue a fellow member. You are off to rescue him and save Atlantis. The same excellence within the main game is evident in this chapter as well. There are some fantastic HOP scenes and puzzles in this chapter. It is a long chapter making this game worthy of the classification “Collector’s Edition.” HOP SCENES: There are twenty-three (23) HOP scenes in the game, many of which are creatively designed, with most scenes being thematic. Many are two-part scenes in which you search for items in one format and then switch to another. They include the usual lists of items and silhouette scenes, some within a storybook setting. However, there are also matching scenes, search and replace scenes, morphing objects within one scene, and one cryptic clues scene. There are three (3) amazing panoramic scenes in which you must expand the scene via arrows to locate all the items. In one, you move the scene up-and-down, which I have never seen before. PUZZLES: There are thirty (30) puzzles within the game. 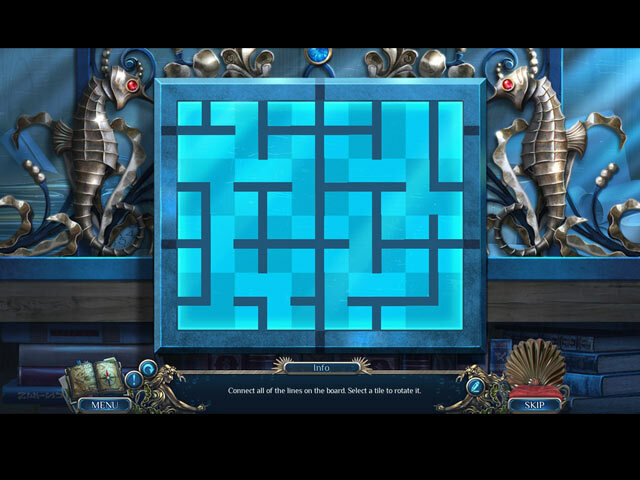 However, there are several instances of multiple-step puzzles. You play one puzzle and then immediately play another one. They vary in design. I found most of them of medium difficulty; however, there are some easy ones as well. SPOILERS: HERE ARE SOME OF THE PUZZLES AFTER THE DEMO: A. Assembly puzzle. Move pieces up-and-down and sideways (using arrows) until an image emerges. B. Multiple step. (1) Switch puzzle. Switch pieces to restore an image on a tracking device. (2) Map puzzle. Follow the directions. Move a car the exact amount of spaces and in the correct direction on a given code until all directions are completed. If you make a mistake you must restart. C. Mathematical puzzle. On a grid with numbers assigned to each row and column, add or subtract holes in each cell of the grid so that the number of holes equals the number assigned to each row and column. BONUS CHAPTER: D. Domino puzzle. Rotate and place dominos within a grid so that all the ends match each other. E. Switch puzzle. Switch pearls so they match up with the background pattern in which they are placed. F. Sequence puzzle. Choose symbols in the middle of a grid which are etched on the two columns on the sides of the grid. They must be chosen in sequence. They light up if the proper symbols are chosen. If you choose the incorrect symbol you must restart the puzzle.